Or, rather, “Ex-para-gus”, as it gets pronounced around here. It’s one thing to have nutrition experts proclaim that green veggies are good for us to eat. 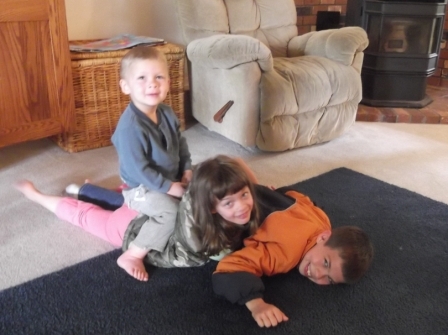 It’s another thing to persuade kids to eat them. One of mine is generally persuadable in the eating-green-things department, but the other two are still suspicious. I was introduced to ‘asparagus rollups’ a few years ago. 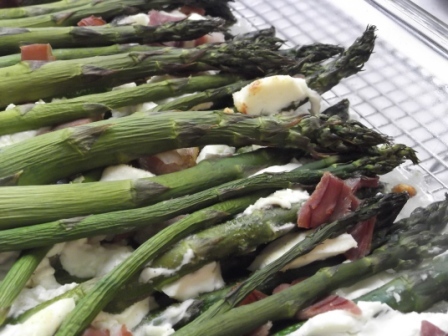 Spread cream cheese and herbs on prosciutto, wrap it around a bundle of asparagus, and grill or bake. Yummy… but a bit labor intensive, and you don’t get all the cheesy goodness in every bite unless you are creative with your knifework. 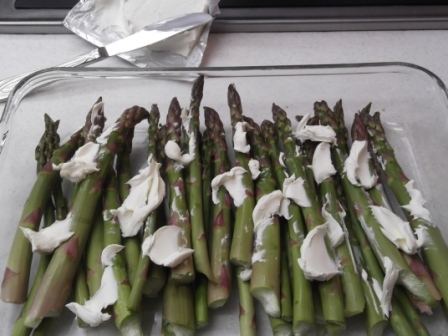 Wash and trim asparagus and lay flat in baking dish. Dot with cream cheese. I add goat cheese, too – if I didn’t have the goat cheese, I’d just use more cream cheese. Sprinkle with garlic and salt. I used about ¼ t. garlic powder and ½ t. salt for this dish. Other times I’ve added pepper, oregano, basil, and onion powder. I’ve also added parmesan cheese, Monterey jack, cheddar and mozzarella. This time I just went with the two-cheese version. I whacked my prosciutto into bite-size pieces. I can hear gourmets groaning from here – but really, this is much better than watching a five-year old try to deal with it after it’s cooked. 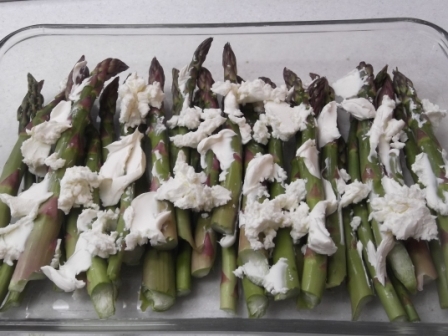 I put one additional layer of asparagus on top of all this goodness, to insulate the cheese a little. Bake uncovered at 350° for 30 minutes. 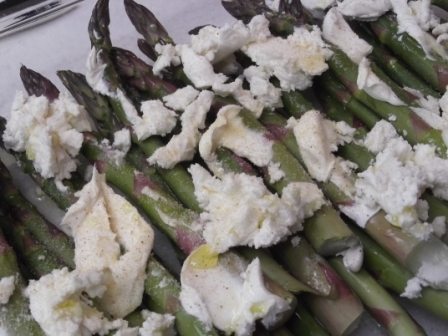 If it’s covered, all the asparagus juice accumulates in the bottom of the dish and makes the cheese soggy. To serve soggy cheese is, in my opinion, a crime against the culinary arts. 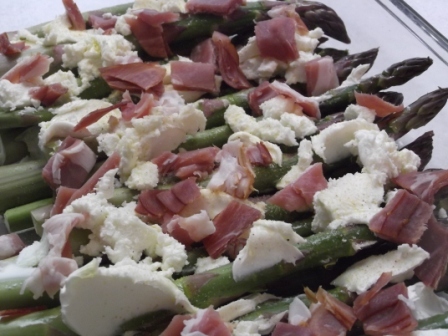 Creamy cheese, buttressed by hot asparagus spears and nestled up against ham, is a delight. I don’t really have a ‘recipe’ for this one, as everything is measured in what my friends call the “-ish” method. As in, it’s about a pound-ish of asparagus. I really have no idea how much it was. But for a certain value of “-ish”, here’s an attempt at a formula. ½ package prosciutto ham, chopped. Or ¾ c. ham. Or bacon. Place most of the asparagus in baking dish. Dot with cream and goat cheese. Add additional cheeses, if using them. 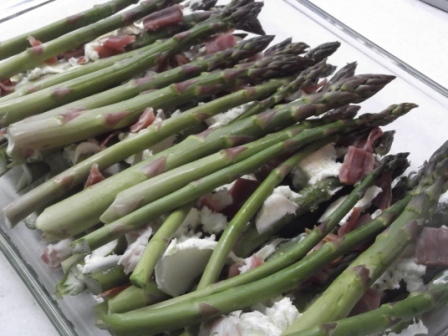 This entry was posted in Side dishes and tagged asparagus, asparagus roll-ups, baked asparagus, GF, Gluten Free, ham, ham and asparagus, prosciotto. Bookmark the permalink. I can just see Moose with a long piece of prosciutto … yeah, cutting it is a good idea 🙂 Yum! !